The single-leading-shoe drum brake (SLS), a.k.a. "leading/trailing drum brake", is a basic type of drum brake design. 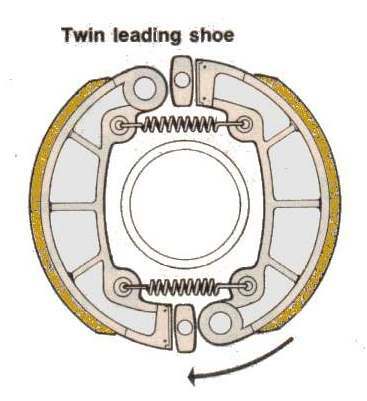 The term "leading/trailing" means that only one shoe is "leading", moving into the rotation of the drum and thus exhibiting a self-servo (or self-applying) effect. The leading shoe is "dragged" into the friction surface of the drum and thus achieving greater braking force. The other shoe is "trailing", moving against the direction of rotation, is thrown away from the friction surface of the drum and is far less effective. An advantage of an SLS brake is that is equally effective whether the vehicle is traveling forwards or in reverse. When the vehicle is moving in reverse, the role of the leading and trailing shoes is switched. What would be the leading shoe when the vehicle is traveling forwards becomes the trailing shoe, and vice-versa. The twin-leading-shoe brake (2LS) is a type of drum brake that has two leading shoes, rather than the single leading shoe and a single trailing shoe of a single-leading shoe (SLS) drum brake. A leading shoe has a self-servo effect, so an advantage of a 2LS is that it provides the maximum retardation in its intended direction of travel, i.e. forwards. 2LS brakes are fitted on the front axle of automobiles, or the front wheel of a motorcycle. A 2LS brake is more powerful than an SLS design. SLS brakes are still used for the on the rear wheel of many motorcycles, and for the front wheel of smaller bikes and scooters. An SLS brake is less powerful than a TLS, but that is not an issue for a motorcycle's rear brake. Compared to cars, bike are higher and have a shorter wheelbase, so weight-transference under braking is much more pronounced. Excessive braking force can cause the rear wheel to lock, so it is normal for a bike's rear brake to be much less powerful than the front. Since 1969, modern motorcycles tend to have disc brake(s) on the front wheel, and sometimes a smaller disc brake on the rear wheel. 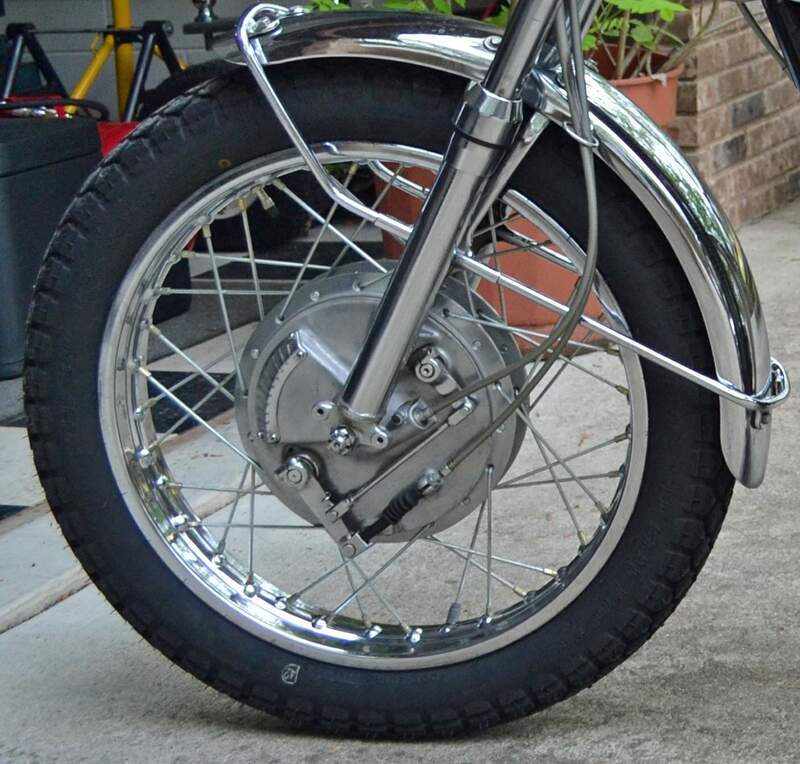 Before disc brakes became commonplace on bikes, performance machines tended to have twin-leading-shoe drum brakes, and some racing machines even had four-leading shoe drum brakes. Let us put all the above in context. Firstly, what is a drum brake? · Brake linings wear evenly. · Brake output torque is appropriate to the application. 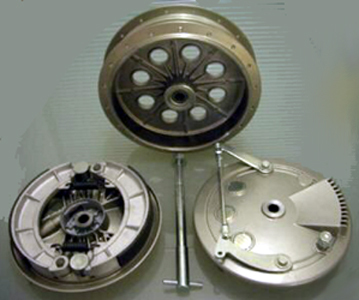 Figure 1 shows a typical arrangement of the shoes and other stationary components in a drum brake. The whole assembly is mounted on the back plate. For clarity, only the inner surface of the drum is indicated, but in practice its rotating outer surface is very close to the back plate perimeter flange. The small clearance between them reduces the risk of dust, water and foreign bodies entering the drum. The brake shoes shown in Figure 1 are forced apart and into contact with the drum by the small hydraulic cylinder, or expander, shown on the right. They pivot about the shoe abutment on the left and are restored to the 'brakes off' position by the shoe return springs. 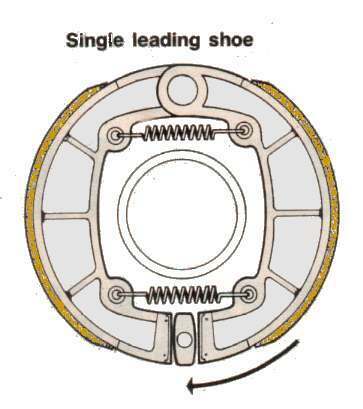 From Figure 1 you will see that, with the drum rotating in the direction shown, the upper shoe is ahead of its pivot point. It is said to be a leading shoe. Similarly the lower shoe trails behind its pivot point and is called a trailing shoe. There is an important difference in the way leading and trailing shoes act under braking. Figure 2 shows the forces acting when a leading shoe is applied. Notice that the frictional drag force has a moment about the pivot point. This increases the input load and hence increases the drag. In other words, there is a self-servo action, which increases the braking effect. Figure 3 shows the forces acting when a trailing shoe is applied. In this case the moment of the frictional drag force about the pivot point opposes the input load, thereby reducing the drag and the braking effect.